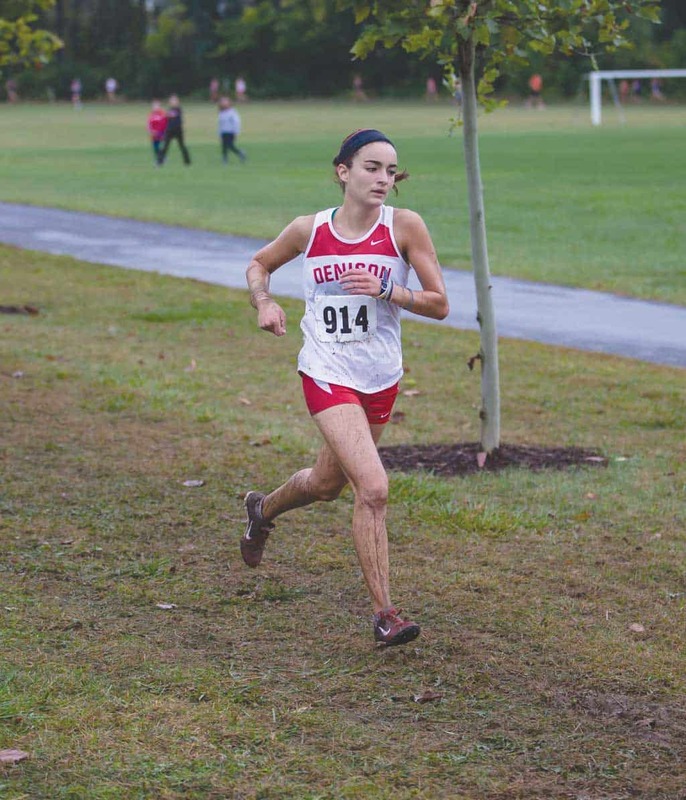 After a tough battle against Kenyon’s Jenna Willett last Saturday, Big Red senior Olivia Galano overpowered the other women to win the 2013 North Coast Athletic Conference Women’s Cross Country Championship in Meadville, Pennsylvania. As a team, the women finished fourth in the overall championship after securing three runners in the top 20. Galano and Willett fought for the win through the entire 6K course before the Big Red senior pulled ahead at the end with a finishing time of 23:07.0, beating, Willett by 4.7 seconds. With the triumph over Kenyon, Galano became the fourth Denison runner in conference history to earn the individual championship. The previous winners include: Julie Hufnagel in 2004, Christine Collins in 2005, and Katie Navarre in 2009. “I still remain shocked that I won the NCAC Cross Country meet. Honestly, prior to the race the only discussion I had with my coaches was the possibility of finishing in the top five,” Galano said. “They emphasized that I should not set the pace for the race, but hang on tight to those that do. So, when the gun went off, that is exactly what I did. I hung on tight to Willett until there were about 1000m left,” Galano added. “Then the decision came: keep holding on and make this a battle at the finish line, or go now, annihilate yourself and don’t look back. So with a few strides of hesitation, I took off as fast as I could and got away from the pack. My mind was screaming ‘Go! Go! Go!’ And as soon as I crossed the finish line I saw my mom sobbing. Her tears of happiness made the victory real,” Galano said. Galano, who is the youngest of five, is very close with her family, so close that her family often sees her compete. “As I sat on the bus after the race, I was overwhelmed with emotions,” Galano added, “Words cannot articulate how I felt. Hearing that my mom, teammates and coaches believed that I deserved this honor made me feel whole again. The people I love the most have watched me fall, never judged me for these falls, and never stopped believing that I could get back up and be better than ever,” she exclaimed. The DU senior originally came to Ohio four years ago because it was the only school that allowed her to be a field hockey player and track runner at the same time. However, during her freshman year, the track coaches had her running the 5000m and that is when Galano fell in love with distance running. For this reason, when Galano returned her sophomore year, she decided to try out for the women’s cross country team. After being informed that she made the time, Galano decided to give it a try. “Honestly, I was awful. I remember running down the country roads and slowly falling more and more behind everyone. Mile after mile I was essentially panting in the dust of my teammates for about the first two months. “Yet despite how awful I was, I always left practice happy and felt replenished as my teammates truly made every day special. The way that they made me feel was what inspired me to train harder. I began to work harder and harder and take running more seriously. “I found that the more seriously I took running, the faster I was capable of getting, and this improvement truly became an addiction,” Galano shared. Looking back at her experience on the cross country team, Galano expressed that it definitely changed her whole college experience. One of her favorite memories was the team’s numerous pre-meet runs. After arriving at the meets, and getting off the bus, the women were always extremely anxious to move around. Moments later, any bystander would be able to find one large group of girls and Coach Fitzpatrick running the course with maps in their hands. “Recently I have been [demoted] from leading the way because my map skills are pretty poor; however, the energy and excitement while we run the course is perfect,” Galano joked. During these pre-meet runs, Galano expressed how imperative they are to a successful race the next day. As the women make their ways around the course for the first time, their pace is relaxed and slow. But, with every step, the adrenaline begins to flow as the Big Red senior knows that tomorrow she will be redoing this course in the context of a race. “It is these runs that make me excited for the race tomorrow, thankful for my teammates, and appreciative of the relationship that I have with my Coaches,” Galano said. When asked to describe Galano, her teammates all agreed that she was a caring and silly person. “Most of my favorite memories [of Olivia] probably aren’t appropriate for this profile. I have a lot though. Even before the conference meet, which she won, she was just lying on this table in a locker room, singing and dancing around and being really goofy,” Evans shared. Besides listening to music, Galano really enjoys hanging out with her friends and laughing. After a great four years at Denison and with the end of her senior year rapidly approaching, Galano was excited to share that she will be moving to New Orleans, La. to be a corps member for Teach For America. Last week was the best week of Galano’s life. After winning the Cross Country Conference and getting her acceptance to Teach For America, Galano couldn’t contain her excitement. “[In the future] I would love to still be involved in running and possibly be a coach myself!” the DU senior shared. However, wherever she is five years from now, Galano believes that is where she will be supposed to be.